Parker is gazing at the main gyrocompass. He was a survivor of USS Lexington (CV-2), sunk in the Battle of the Coral Sea. Note engine order telegraph shows standard speed ahead. The equipment below the telegraph with the three black knobs was used to send changes of the RPM shaft speed to the controllers in the motor rooms. The man is Chester I. Isaacson, QM 1/c. Note that the photo negative was printed reversed (see clipboard on the right side of photo). Photo taken during shakedown cruise off San Diego, CA, early 1944. The door at left is the entrance to the sound hut (sonar shack). Seated in the chair is LCDR John Burnham, the Skipper, and to the right is Lt(jg). Hugh L. Hubbard. Chief Treiber made Ensign while aboard and was transferred. He became a LTCDR. He was an exceptional man, a great guy and just about any other superlatives you could add. This panel has shaft revolution indicators for BOTH shafts. The port indicator is barely visible to the left of Lawler's shoulder. Looks like about 390 revs on the starboard shaft. Standard speed ahead shows on the annunciator above Lawler's head. Standard speed ahead shows on the annunciator above Wofford's head. 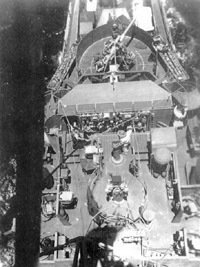 The men would know what was going on with the port shaft, but could only control starboard shaft. Shaft speed could be increased/decreased by one RPM. I believe these small incremental changes were made by moving the small control wheel on a level with Lawler's phone mouthpiece. Clockwise, ahead; counterclockwise, astern. Large RPM changes were made with the large control wheel, 2/3 ahead to standard ahead, for example. This controlled the speed of the main engines via Selsyn motors on the engine governors. This, of course, increased/decreased main generator speed and, thereby, output. The small changes in shaft RPM were sent to the throttle man via the apparatus just above Wofford's right shoulder. The desired RPM would be transmitted from the bridge and would be shown as single digits in each of the three top small rectangles above the black circular knobs. 3 9 0, for example. The throttleman would then rotate the black knobs, matching these digits in the bottom rectangles. The equipment to the right of Wofford, with the two 'D' handles on the face, is a piece of communications gear. The speaker is visible between the two handles, as are several switches in a row at the bottom. The microphone was on the face also and you just pressed down on a toggle to speak and released to listen. The toggles on the bottom selected the various stations with whom you wished to speak. That black slotted object above the communicator looks like a siren/horn. That would get your attention, wouldn't it?! Come to think of it, there were similar sirens in B-1 and B-3. I cannot remember their purpose. Must have been important. 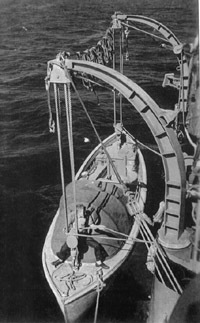 Note lube oil drums tied to lifelines. Information and photos courtesy of George D. McCarthy, MoMM2c, USS Hilbert DE 742. 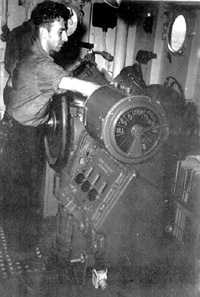 Information and pictures contained on this website are Copyrighted by the individual authors, USSHilbert.Org, and the crewmembers of the USS Hilbert. All Rights Reserved.